Its easy to see why the Miami Marathon and Half Marathon has emerged as a top destination race for runners from around the world. Since its inception in 2003, the Miami Marathon (26.2 miles) and Half Marathon (13.1 miles) has attracted thousands of runners who escape the winter cold and fly down to Miami with its breathtaking course and vibrant atmosphere that capture the best of what the city has to offer. Traditionally held at the end of January, the event is one of the fastest growing annual marathons in the world and now attracts more than 25,000 runners from all 50 states and more than 80 countries  a diverse racing pool that reflects the international makeup of the city itself. From first-time marathoners looking to test their endurance to seasoned runners trying to beat their personal bests, the Miami Marathon and Half Marathon is filled with inspiring individuals with stories and motivations that fuel themselves and others to the finish line. The race is a USTAF-certified, flat, single loop course with each mile showcasing the best of Miamis iconic landmarks and breathtaking views. 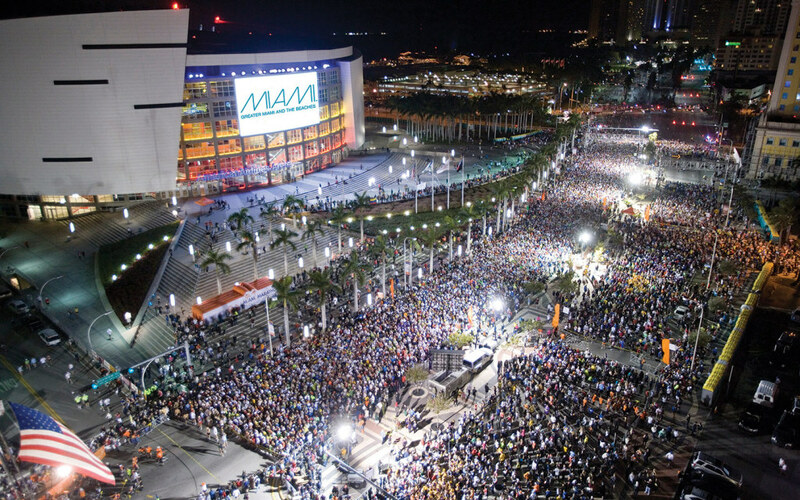 Runners participating in the marathon and half marathon start together at 6 a.m. in front of the AmericanAirlines Arena, home of the Miami Heat. They run the same scenic route for the first 12.8 miles of the race, running across the MacArthur Causeway to Miami Beach as the sun rises over the Atlantic Ocean, then down iconic Ocean Drive and Washington Avenue before crossing back toward downtown over the scenic Venetian Causeway. As the half marathoners peel off and race for the finish line at Bayfront Park, the participants running the full marathon continue their route through downtown and popular local neighborhoods  such as Brickell, Key Biscayne and Coconut Grove  before circling around toward the Bayfront Park finish line themselves. All runners are greeted at the finish line with a unique, colorful medal that is designed by a different artist each year and a festive post-race celebration. Throughout the course, aid stations help runners stay hydrated with water and Gatorade and medical personnel are ready to provide first-aid care if needed and a color-coded event status system at each mile marker will indicate the status of the race based on the current course and weather conditions. More than 20 entertainment stations are scattered throughout the race as well, with live music and other forms of Miami-style entertainment to help runners power through. If youre not racing but still want to watch and cheer on friends or family members participating in the race, there are several cheer stations where you can hold up signs of support, pushing your loved ones to keep going. If running a marathon or half marathon is too much for you  or if you need a warm-up leading up to the big race  the Tropical 5K is the perfect way to kick off race weekend. The 3.1-mile race, held the day before the Miami Marathon and Half Marathon, begins on Watson Island as runners run over the MacArthur Causeway and finish at Nikki Beach, a large oceanfront complex at the very beginning of Ocean Drive. The Miami Marathon isnt just for adults  children can get in on the fun as well! Kids Run Miami is a countywide program that invites all middle schools in Miami-Dade County to establish a consistent running program in order to promote a fit and healthy lifestyle while teaching children to create and fulfill goals. Each year, schools and teachers encourage students to run 25 miles over 15 weeks leading up to the day of the Miami Marathon & Half Marathon, where the students run their final 1.2 miles on the same course used by the runners to finish their own marathon after the conclusion of the main event. Kids Run Miami helps hundreds of students reduce the risk of obesity, diabetes, heart disease and high blood pressure. Mana Wynwood, located within the trendy Wynwood Arts District, will be the home of the two-day Miami Marathon & Half Marathon Expo where participants can pick up their race packets and discover resources that can help finish the race. The expo will feature more than 100 exhibitors offering official race merchandise and the latest in running footwear, apparel, nutrition and technology. The 2018 edition of the expo will also feature a variety of health and fitness classes and competitions led by several well-known trainers. 6:00 a.m. Fitbit Miami Marathon and Half Marathon produced by Life Time runners start at AmericanAirlines Arena, 601 Biscayne Blvd. 6:30 a.m. Spectator bleachers open at Bayfront Park, 301 Biscayne Blvd. Pre-Race Loading: Shuttles will be leaving the Miami Beach Convention Center at 4:00 AM to ensure timely arrival at the Start line. Post-Race Loading: Post-race shuttles will operate from 8:00 AM to 1:00 PM. Shuttle loading will be located at NE 8th St. and Biscayne Blvd., next to American Airlines Arena (North Side). Friday, January 25, 2019  12 p.m. to 7 p.m.
Saturday, January 26, 2019  10 a.m. to 6 p.m. The Fitbit Miami Marathon & Half Marathon produced by Life Time Expo will be the only place where you can pick up your registration packet. Remember to bring a picture ID. If you need to have someone else pick up your packet, you must provide them with a copy of your photo ID and bib number.